Transform your sales performance with this sales training online. This course will change your thinking. You don’t know what you don’t know….until now! Powerful sales techniques incorporated from masters of sales, communication skills and the world of NLP. 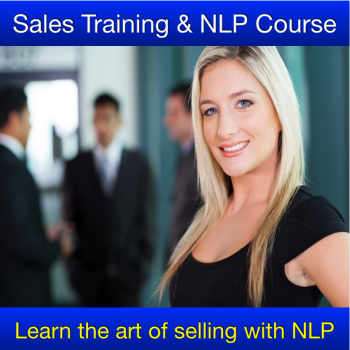 Learn from Anthony Beardsell, NLP Master Trainer with 20 years sales success. Outstanding training for outstanding sales results! Learn a 5 step sales process which gets amazing results no matter what product or service that you are selling. How to build essential rapport with all of your customers. If they like you then they will buy from you! Discover how to read a clients body language. Learn how to find out a clients buying and decision strategies so that you can sell to them in a way that appeals to them. Techniques to empower you to achieve outstanding results in all areas of your life. Discover how different people have a preferred means of communicating with themselves and others so that you can design a perfect sales pitch for them. Learn how to read clients eye movements in order to discover how they are thinking. Use of metaphors and other advanced language patterns in selling. How to anchor positive thoughts in a clients mind towards your products or services. How to handle any objection with ease. Setting goals and outcomes in order smash sales targets. Many more tools and techniques to get amazing sales results. If you are looking for online sales training for your team or salesforce, then look no further. We can offer discounts for multiple registrations. You may allocate your own course tutor, who can remotely monitor your students progress and set tests. All of our e-learning courses are made up of modules, this one has 17 modules. We can alter the course to suit your specific needs. We can provide you with your own course which sits either on our servers or on yours. Please call us to discuss your options – +44 (0) 114 2360047. How does the Sales Skills e-Learning work? Our Sales Skills e-Learning is provided to you via a Learning Management System (LMS), which is a database of training material held on our servers at Excellence Assured. In order to ensure that you have the best possible learning experience and that you can learn in a way that suits your preferred learning style the course material is provided in several formats. Course manual (PDF Documents) which you can download and print off if required, so that you can make notes as you learn. Videos (Quicktime files) which you can view online via your unique login. Audio (MP3 audio files) which you can listen to online and also download so that you may listen at your leisure and play on your preferred player. Exercises – The best way to learn is to do and we provide you with optional exercises for each module. Practice what you have learned and you will retain the material with ease. Self Reflection Exercises – Should you choose to certificate in the Sales Skills Diploma then you will be required to complete the course Self Reflection Exercises. Why wait? You can start your sales training today!